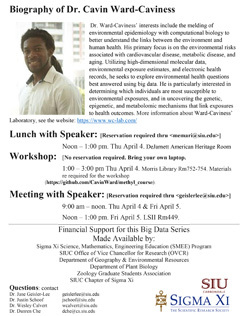 CARBONDALE, Ill. — Understanding applications of biological data for environmental health is the focus for the fourth “Big Data” lecture at Southern Illinois University Carbondale. As part of an ongoing series sponsored by SIU’s Chapter of Sigma Xi, the lecture and visit will assist local researchers in utilizing big data. The upcoming talk is set for April 4 and will feature environmental and computational biologist Cavin Ward-Caviness. 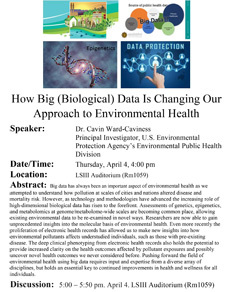 With a focus on understanding environmental risks on a variety of health conditions, Ward-Caviness uses big data analytics to utilize high-dimensional molecular data, environmental exposure estimates and electronic health records. His research interests give him a unique perspective on big data applications in public health. As an investigator for the Clinical Research Branch of the United Stated Environmental Protection Agency in Chapel Hill, North Carolina, Ward-Caviness regularly works on research projects with the goal of protecting public health and well-being. Set for 4 p.m. on April 4 at SIU’s Life Science III Auditorium (Room 1059), the lecture includes a presentation, along with time for questions and discussion. As part of his visit, Ward-Caviness will also hold a hands-on workshop for interested faculty and students. The workshop is set for 1-3 p.m. on April 4 in Morris Library 754/754. Participants should bring their own laptop. Additionally, limited spots are available for meetings with Ward-Caviness on April 4 and 5, and for lunch with the speaker from 12-1 p.m. on April 4. Prior reservation is necessary for both the lunch and the meeting. Contact Jane Geisler-Lee for meeting reservations and Majid Memari for lunch reservations. Sigma Xi is a scientific research honors society that has had an active chapter on the SIU campus for more than five decades. The Big Data seminar series is made possible by a grant from the Sigma Xi Science, Mathematics, and Engineering Education (SMEE) program and support from the Office of the Vice Chancellor for Research at SIU. A final lecture for the series is set for next month. For more information, contact Justin Schoof, SIU professor and chair of geography and environmental resources, or Jane Geisler-Lee, research professor of plant biology. Seminar at 4 p.m. on April 4 at Life Science III Auditorium room 1059.